There are new comics in comic shops and available for download on many of your favorite digital devices (no, not your microwave) every Wednesday. I have recommendations for you. One of them is a limited time offer... for a digital comic. Go figure. American Vampire: Survival of the Fittest #2 American vampire hunters go to Romania to find a cure for vampirism and not get killed by Nazis. The first issue of this mini-series was excellent. Captain America #1 They're re-starting Captain America. Official summary: ""Bestselling Cap writer Ed Brubaker and superstar artist Steve McNiven bring you the next huge chapter in Steve Rogers life, and it's a perfect jumping-on point for fans of the Cap movie. A funeral for a fallen friend turns into a race against time as the original Captain America makes his explosive return!" DC Comics Presents: Batman Gotham Noir #1: This $8 comic contains an old Batman story by the aforementioned writer Ed Brubaker and artist Sean Phillips, whose sharp, tense Sleeper, Criminal and Incognito series have been some of the best gritty crime comics published in recent years. Their comics aren't flashy but they are consistently very good. FF #7 I've been enjoying this new take on the Fantastic Four a lot, but I don't know the group's history, so you tell me why this official summary is meaningful: "The Return of the King. Black Bolt is back and is determined to reclaim his throne." Red Wing #1 A new series from Jonathan Hickman, writer of Marvel's stellar FF series. Official summary: "To stay alive in the future, the best fighter pilots in the world not only have to perfect their skills and master their aircraft, they also have to know how to travel through time. Brought to you by award winning writer Jonathan Hickman and possibly the best new talent of the year, Nick Pitarra, the Red Wing is the story of the greatest battle in the history of the history of three worlds. X-Men: Schism One of my favorite super-hero comics writers, Jason Aaron, begins his X-Men run with this. Official summary: ""The X-Men event of the decade starts here! It's never been a more dangerous time to be a mutant. Even with their numbers at a record low, the world refuses to trust mutantkind…and after a mutant-triggered international incident, anti-mutant hatred hits new heights. Of course it's at this moment, when the mutant race needs most to stand together, that a split begins that will tear apart the very foundation of the X-Men. From superstar writer and Marvel Architect Jason Aaron and a full roster of comics' top artists, this is an X-tale that will reverberate for years to come!" Crysis 2 Official summary: "Trapped on the Lingshan islands in the South Pacific, Prophet and the survivors of Raptor Team are on the move, trying to stay one step ahead of the alien invaders awoken by the North Koreans. While hiding, Prophet reveals the details of his last mission in Columbia, how he came to meet the mysterious Jacob Hargreave, and how their mission on Lingshan may hold the key to mankind's survival." Pokémon Black and White Vols. 1 & 2 Official summary: "Meet Pokémon trainers Black and White! White has a burgeoning career as a Trainer of performing Pokémon. Black is about to embark on a training journey to explore the Unova region and fill a Pokédex for Professor Juniper." Star Wars: The Old Republic: Lost Suns #2 official summary: "There are dark secrets behind the treaty that brought peace to the galaxy and an end to the war between the Jedi of the Republic and the Sith Empire. Now, with rumors of the secrets spreading, the galaxy is afraid a new war may be beginning . . . Elite Republic spy Theron Shan has been assigned to find the old Jedi Master behind these rumors. Previously thought lost forever in Sith territory, Ngani Zho is back and more peculiar than before he left. Theron has his hands full with Zho, a troublesome thief, and the threatening Sith Knights who are also on Zho's trail!" 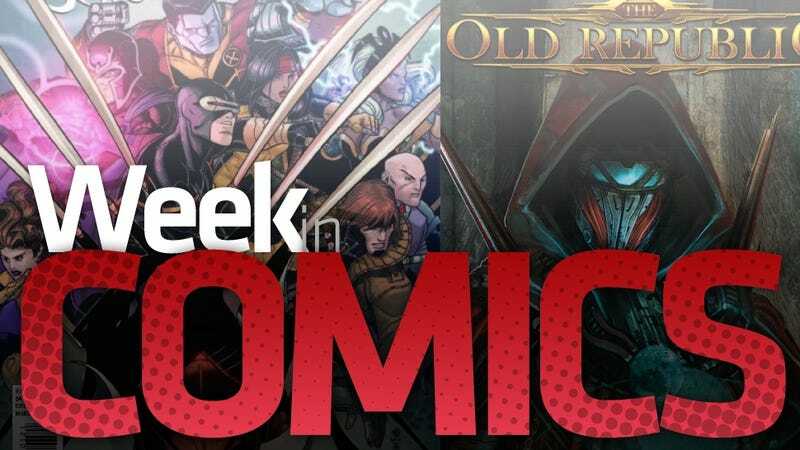 The ComiXology Comics app and website offer a fresh batch of new and old digital comics this week (though beware that Marvel doesn't offer comics on all of the services' platforms). Highlights this week include the first few issues of Todd McFarlane's 1990 Spider-Man series (but don't blame me if the writing isn't very good) and a bath of recent standalone ".1" issues from Marvel, the best of which were Wolverine #5.1 and Secret Avengers #12.1 (only one of those is about a birthday party for Wolverine). But the highlight and best value is the Planetary Digital Omnibus, which is a limited edition $25 collection of the great series' 27-issue run. The series is about a group of superpowered investigators whose tours through the world's oddest events had them intersecting with thinly-disguised versions of some of the most iconic moments in comics history. This is one of writer Warren Ellis' best comics, if not his best. The only problem here is that it's a limited edition which, of course, makes no sense for a digital product. I didn't read many comics last week and few of those were very good. I enjoyed the first two issues of Mystery Men, a Marvel mini-series about some new pulp Marvel heroes who fight crime in the 30s (a new issue is out today). I liked that latest issue of FF. But the best comic of the small batch that I read was Nick Spencer's Secret Avengers #14, which was a standalone story about the experiences of super-powered and non-super-powered people who see their loved ones killed on the battlefield. Well-paced, well-told, as Nick Spencer's comics almost always are. It's strong and one of the few cross-overs with the Fear Itself series that I've liked, but it's not essential.